The Caravan Inn Motel offers 37 modern units offer clean, pleasant accommodation and friendly atmosphere at reasonable rates. All rooms at the motel offer guests with the choice of smoking or non-smoking rooms, Full Cable TV with remote, Individually Controlled Heat/Air Coniditioning, 4 Piece Washroom, and in-room phone with free local calls. 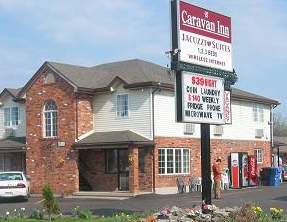 This Niagara Falls Motel also offers guests free at-door parking, an outdoor pool and a childrens play area on-site. Located only minutes away from the famous falls and major attractions such as Marine land, Maple Leaf Village, Skylon and Minolta Towers, Clifton Hill and White Water Park; not to mention Niagara’s many fine wineries, beautiful Parkways and a great selection of golf courses and driving ranges.